Puff, the Magic Acorn, fell from a Tree - And dangled from a Silver Chain - In a land called Jewelry. 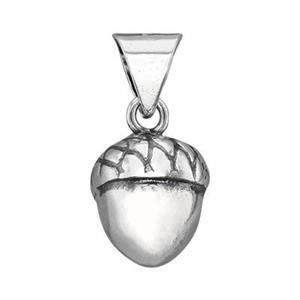 Our Magical little Puff Tree Acorn Charm, 3D, bright Sterling Silver. Complete your own lyrical design with one of our finished Sterling Silver Neck Chains. this charm is very nice and popular with my customers. I had another acorn that was far too heavy. This one seems just right. I usually remove the bail because I use it for earrings.